On Sunday, Dec. 16, hundreds of vehicles were trapped on the roads of western Ukraine due to severe snowstorms. According to various mainstream and citizen media reports, the situation was critical, as many of those stuck inside their cars were running out of food, water and gasoline, while the weather was not getting better. People please share this.... Maybe someone will be able to do something!!!!!!!!!!!!!!!!!!!! Some ten hours after the first updates, Pelekh wrote [ru] that the bus and other cars nearby were finally dug out of the snow, and his relatives were on the way to the nearest town. Pelekh's mother told him [ru] that the villagers had taken in the children from the cars, to warm them up, while their parents had stayed behind; some ended up suffering frostbite and were eventually taken to a hospital. [...] If you know specific people who need help at a specific location - write about it. Because, damn it, half of Facebook is filled with screaming about "cars are snowed in, out of gas, people are freezing," but there is zero of specific info on where to go to and where help is needed. Human brotherhood and mutual help are the most important things in moments like these. [...] I cannot understand how, in our times, it was possible not to warn people against [long-distance] driving in such weather? Especially bus drivers. 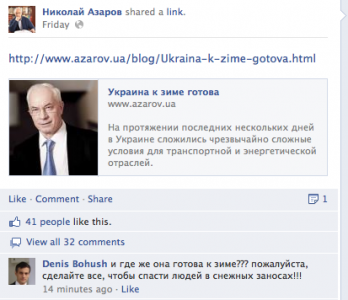 A screenshot of PM Mykola Azarov's Facebook page, with a link to his article titled "Ukraine is Ready for Winter" - and one of the user comments: "Is it really ready for winter??? Please do everything to save the people who are trapped in snow!!!!" You were recommending that everyone grab shovels and start working. Now everyone is recommending that you yourself grab a shovel and go remove the snow.